Irregular verbs are the most important and at the same time for many students the most difficult part of learning English. These verbs are very common and if students learn them, their English improves radically. But they have to learn them! Therefore, any activity that makes the learning easier and more fun is welcome. Recently Svetlana Kandybovich published a great game to help children learn irregular verbs. Reading the post I realised that I have been using three games that other teachers might want to use. And thus, I decided to share them. In this post, there are three games to make the learning of irregular verbs more enjoyable. The first game is crosses and noughts, the second is called Sprint and the third one is Ski Jump. Print the following worksheet. Print one copy of the first page for each student. The second page contains the same list three times so you need to print just one page for three students. 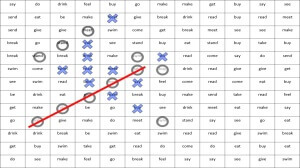 Read the list of the irregular verbs with the students to ensure that they pronounce the verbs correctly. Then give them about five minutes to work on their own and learn the irregular verbs from the list. Five minutes later, ask the students to work in pairs and go through the grid line by line and say the past tense and past participle of the verbs. Stop them after three minutes and tell them to turn the cards with the verbs face down. Now they play crosses and noughts. The rules are simple. Players take turns, and they draw a cross or a nought (one player draws one symbol all the time). Their aim is to have five symbols in a row. If they achieve this, they win. In this game, however, they can draw their symbol only if they say the past tense and past participle of the verb in the square. If they fail to do this, they have to play somewhere else. Let the students play for four minutes. If they finish earlier, tell them to play on the other sheet. Once they finish, students turn the cards with the verbs face up, and take a pen or pencil. Now, they have four minutes to fill in as many columns as possible with the past tenses and past participles of the verbs given. They must not skip any square. If they do not know the verbs, they can have a look at their cards. You need the worksheet again. Follow the instructions above, till the moment when students stop learning the verbs. Now students choose one line each. One starts from the right side and the other from the left. When you say START, students have to say the past tense and past participle of all the verbs on their line. They must not skip any. Their aim is to be quicker than their partner. The winner is the student who gets to the end of their line first. If they do not know any of the verbs, they can have a look into the card. It is a bit noisy, but it is fun. This is a zero preparation activity. After learning the irregular verbs for some time, ask one of the students to come in front of the class. Tell them that they have 30 seconds to say as many irregular verbs and their past tenses and past participles as possible. Stop them after the 30 seconds and count how many verbs they produced (each word counts as one point). Then ask other students to do the same. Reward the winner. In my experience, the best are able to get over about 100 points. Thank you. I have to earn some money to pay for the site. That is why I have to insert the ADS sometimes. Then the site http://www.envocabulary.eu might be better for you. These are materials for teachers. There are materials for learners of English.